Publicity Stills of "Nada Sou Sou"
Orphan Yota (Satoshi Tsumabuki, WATERBOYS) is a hard-working 21-year-old who dreams of opening up his own restaurant. He has a little step-sister, Kaoru (Masami Nagasawa, CRYING OUT LOVE, IN THE CENTRE OF THE WORLD), who lives on an island off Okinawa but moves in with Yota to begin college on the mainland. Yota had promised their mother on her death bed to care for Kaoru at all cost- even at the expense of his relationship with his beautiful medical student girlfriend. 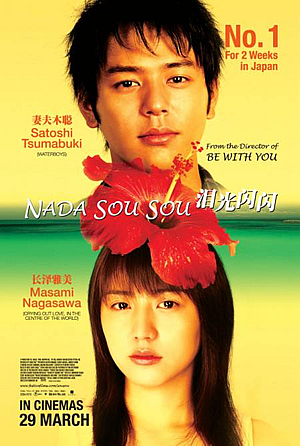 Nada SouSou broke weekend box-office records when it was released last year in Japan, and became the No.1 film there in a short space of time. Yet as movie aficionados in Singapore know, success in Japanese theatres is not a predicator of success for Singaporean screens. Remember The Sinking of Japan? The outlook of this movie was indeed promising. A stellar cast, not to mention beautiful and talented, splendid and picturesque scenes from both Okinawa and the mainland, some attempts at traditional elements and simple plot are all good ingredients for a film such as this. It even goes so far as to highlight areas that are not visibly seen in Japanese society – the problems of the poor as well as frictions between the ‘classes’. Inspired by a true story and a song written by Ryoko Moriyama, Nada SouSou means ‘never ending tears’ in the Okinawan dialect. Yet, though engaging in a somewhat abortive Korean type tearjerker, this film fails to deliver its promises of never ending tears. The tears may have flowed freely for its thespians, but almost too rarely for its audiences and ends up as a mere mediocre effort. The second act seemed a tad too ponderous as the scriptwriters engaged too many subplots and issues, and fumbles in tying all the loose ends in the abrupt and quick final act. This was all the more disappointing as the first act setup high expectations for Nada – smooth, reflective and emotional flashbacks intertwined with the present day, which was artfully sequenced and directed. The true hero of the show is definitely good guy Yota, played by the charming and versatile Satoshi Tsumabuki (Water Boys, Spring Snow). He alone can be a reason for watching Nada. Nonetheless, hero or not, Yota could not save the film from mediocrity. His life, tragic until the end, all the more proves that nice guys do finish last. And this robs you from properly enjoying this film, which would have been an otherwise sensitive, intimate and reflective tale.